This page is part of the Twitter location search resource on Thoughtfaucet which contains tutorials for Tweetdeck and Hootsuite, examples, caveats and how to find latitude and longitude in order to make a geocode. Here are a selection of Twitter searches by location. Each one has a geocode and map so you know how far it reaches. If you don’t find the search code you need in this reference, leave a comment and let me know what you’re after. I’ll update this reference. Twitter search can filter by the location of a Tweet if the user has location services turned on. If the Twitter user doesn’t have location turned on, Twitter can filter tweets based on the location in a Twitter user’s profile. If that is left blank, then you won’t be able to find that Tweet using a standard location search. Additional background on this concept is at the beginning of the online version of my Listening Strategy presentation. Using geocodes to filter tweets based on location is what locative media geeks refer to as setting up a geofence. Here are some example geofences and their twitter search strings. One of the specific ways that geocoded Twitter searches get used is during emergencies and weather events. The challenge with using Twitter to monitor these kinds of things is that people use a variety of relevant terms–some official, some folksonomic, some just random relevant words. This search eliminates retweets that include the “RT” customary signal and include a variety of word markers. I’ve eliminated the word “election” as well to keep the search focused on things which are immediately important in an emergency environment. 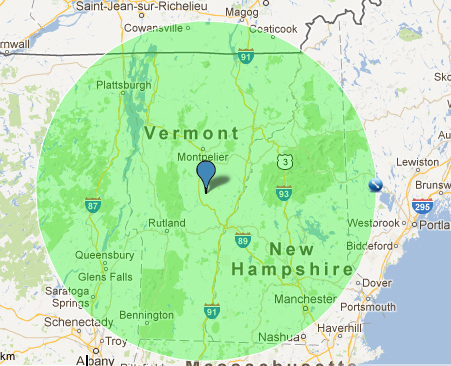 You’ll notice from the image that, since Vermont isn’t a very round state that we’ll be pulling in Twitter posts from some of the areas around Vermont as well. Also note that in addition to hashtags this twitter location search filter also includes the words “power” and “flood” in case people are tweeting about those words but don’t know about hashtags etc. This is pretty much the same as the Vermont search above but is instead set to cover New York City. Sometimes you want to do an either or kind of search. For example, in Burlington Vermont there are two hashtags which get used: #BTV and #BVT. Some people use both, some people use only one. If you want to merge those streams and limit by geography, use this search string. Note, that this technique will work with any of the other search strings as well. Example: Tweets with “malaria” within 500k of the Whalley Arms public house, UK. Contains the word “malaria” and is within 500km of the Whalley Arms public house in Whalley UK. Combining some of the techniques you’ll see in the other examples, you can search for just Tweets that originate within 100meters of Zuccotti Park and also contain the hashtag #OWS, which is often used on Tweets specific to the “Occupy Wall Street” movement. 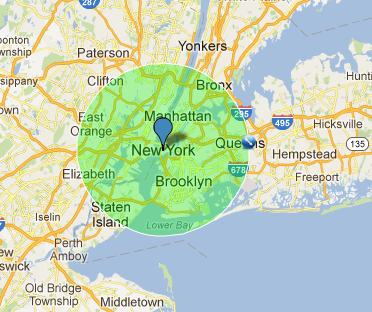 Can you set a polygon geofence for tweets (not a simple center point + radius)? Unfortunately you cannot set a polygon or draw a border to find tweets by geography. It only works with a center and radius. If you set up multiple searches you can overlap them in other software to create other kinds of shapes, but that’s just adding up circles as well. It’s tricky for certain and less than ideal. But there often ways to get close to what you need if you get creative with how you assemble the circles.